Last summer, when I did my first project with the meteorite lab, a gentleman had dropped of a box full of rocks. In this box were about four large ziploc bags, each loaded with rocks that were cataloged on 3×9 index cards. On these cards he noted where the samples came from, when they were collected, and most importantly, his assumption of what type of meteorite he found. He obviously went to a lot of effort to collect these rocks and he was wanting us to tell him if any were meteorites. Unfortunately, the gentleman didn’t find a single meteorite. Instead he had some really nice river rocks. They all displayed the smooth contours that typify rocks of a fluvial environment. To be fair, finding meteorites isn’t easy regardless of what it may look like on T.V. He was obviously passionate about his hunt as displayed by the number of locations he had visited during his meteorite search. So, in no way am I denigrating those that hunt the space rock that I may end up studying. It actually makes for a great teaching moment. Fusion crust– This is the shiny black surface that forms on a meteor as it rockets through the earths atmosphere. The exterior starts to melt from the friction generated heat, and if the meteor is large enough to survive its bumpy ride, instantly cools to form a glassy, black surface. It’s also common to see a matte surface instead of a glossy one. If you see a rock with this characteristic you’ve got a meteorite. One caveat though: not all meteorites will retain their fusion crust. It can weather away if left to the mercy of earth’s climate for too long. Just know that terrestrial rocks will not have a fusion crust. 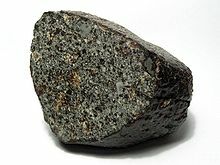 Chondrules– I would say that these are the definitive characteristic of a meteorite. No earth rock comes close to mimicking the appearance of these little spherical inclusions. They’re not always visible in a hand sample, but if you see them with hand lens, you have a meteorite. The same caveat applies with these as well: weathering can sneak in through surface cracks and eat away at chondrules and leave behind the vague outline of relict chondrules. Regmaglypts– This fun-to-say word simply refers to the thumb-like imprints that form on the exterior of a meteorite. 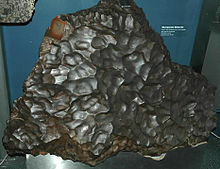 These are common in iron meteorites as well as stony meteorites. Unfortunately the process behind their formation isn’t one that I understand well enough to explain, so I’m not going to get into details. Magnetism– This is shared by both space and earth rocks alike, making it a tricky diagnostic tool. The more iron-nickel you have in a rock, the more attracted it is to a magnet. However, meteorites that come from the moon and Mars are not magnetic. These are nearly indistinguishable from earth basalt unless you plan on doing an oxygen isotope analysis. For a great explanation on meteorites and magnetism, along with the best advice I’ve seen concerning the subject, click here. Rusting– This isn’t one I thought about including until I came across a YouTube video where a guy said that the presence of rust spots was a sure fire sign of a meteorite. If this were the case, than the entire Columbia River Gorge is full of meteoritic material and not basalt (if only it were true). I have seen plenty of basalt with oxidation that occurs in the form of rust. I think that about covers the basics behind identifying meteorite hand samples. This list is by no means comprehensive so please don’t look to it as the only source of information available. The Cascadia Meteorite Laboratory, Northern Arizona University Meteorite Laboratory, and Washington University in St. Louis have great websites with even nicer pictures detailing how to identify a meteorite. This entry was posted in Uncategorized and tagged meteorite identification, Meteorite Monday, postaweek, science by glacialtill. Bookmark the permalink. I think I’ve found some meteorites. In the Sahara. Can’t wait to have them in my paws again to get them checked out. p.s They are black and shiny and pitted like the iron one in your photo above. They are heavy too, albeit pretty small. Very black, very shiny, very pitted. Judging from your description and where you found them, I think you might have yourself some meteorites. Let me know when you get them back because I’d love to see the pictures. I think I found a 200kg meteor in the swamp of Michigan’s upper peninsula. It’s weight is very deceiving for its size. How does one confirm? Shoot me an e-mail with three or four hi-res pictures at ryan22@pdx.edu. I’ll take a look at it and let you know what it could possibly be. You can send me an e-mail at ryan22@pdx.edu. I do ask that you send me no more than 5 pictures and please attach them as individual files in the e-mail and not as a zip file.